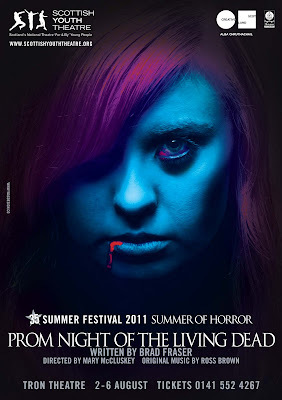 I am in Prom Night of the Living Dead and play Shape one of the evil witch Morgan's henchman. Today we spend the best part of the day running through act one in its entirety and blocking the first scene of act two, after we had done our daily physical and vocal warm ups. My favorite part of the course this far is definitely the character development as it really does help you connect with the role you will be playing in the show. I am looking forward to being able to perform in front of the audience and also seeing everyone truely become their characters. I think that I would like James Franco to play me in a film of my life because he is a really good actor and people have said in the past that I look slightly like him.